Here are some tips on first date do’s and don’ts. Read on and practice it. 1. Be punctual – First impression counts. Being punctual shows how much you care about the date. It reflects your personality as a responsible and disciplined person too. 2. Be creative – Men can always bring a small gift or a bouquet of flowers for his date. Don’t give excuses like afraid of being old-fashion and so on. It’s ridiculous! It works very well in this century, and chivalry isn’t dead! Women can also bring a gift for the date too. It doesn’t have to be a grand and expensive one. Simple and nice will do. It will make the date feels special. 3. Dress it up – This is extremely important, people. How well you dress yourself up somehow implies on how much you want to look good on the date. 5. 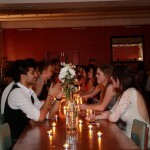 Maintain your eye contact – This is one of the key to either successful or disastrous date. Your eye contact reflects much of your interest in your date, as well as personality which include respect and sincerity. 6. Be confident – Feel confident about yourself and that will really contribute lots to the date. You look great when you feel confident. Confidence in you will make the partner feel more comfortable with you. It really works. 7. Relax yourself – Relax yourself and you will not look nervous. When you look nervous, you’ll make your date nervous too. And the whole date will be screwed up. Just take it easy, have fun and relax yourself. I have discussed in the previous post on how to calm yourself down. Check it out. 8. Just be yourself – Hey yo, people! You are now on a date and there’s no big deal. Just be yourself and you will feel better. Your date agreed to meet up and one of the obvious reasons is to know you better. So you don’t have to pretend to be someone else just to impress your date. Be natural and be yourself. That’s good enough. As first date decide, where your relationship will proceed, So it is very crucial in dating. Most people get scared , nervous and appear needy and desperate, this is where they portray themselves not so confident and anti-social guy/girl. This article should give them nice preparation list before they jump into the first date.